Earlier today we received an inquiry from ‘Tana’ who requested assistance deciphering the part numbers used for the different Arsenic Quick test kits for detecting dissolved organic arsenic (As+3 & As+5) in water. Manufacturer’s Product Number: 481396-2, this is on your website. We thank you for contacting us with this question, Tana, and feel confident that others besides yourself have had similar questions regarding the manner in which ITS opted to label their line of Arsenic Quick Test Kits. Hopefully the information below will clear things up for you. The ‘-2’ you mentioned refers to the number of tests contained in the kit — which means you purchased a kit called the Arsenic Quick Low Range and it contains a total of two tests. If you want the Arsenic Quick II, then from what we know, you would need to purchase ITS part number 481303. As packaged by ITS, that kit contains 50 tests and should have the following detection levels on its color chart: <1, 2, 3, 4, 5, 6, 7, 8, 10, 13, 20, 25, 30, 40, >50, >80, >120, >160 ppb (µg/L). You also mentioned that you want ‘the most accurate test’. All of the Arsenic Quick tests bearing the EPA/ETV certification should give accurate results when used properly. The differences between the kits lie in the precision offered by each kit and in the low level detection limit offered by each kit. No matter which Arsenic Quick Test Kit you choose, please keep in mind that the EPA action limit for dissolved inorganic arsenic in water currently sits at 10ppb so if you detect arsenic concentrations greater than 10ppb, we suggest having your water tested immediately by a certified water testing laboratory. 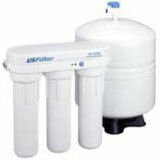 Then, depending upon the results of the ‘official’ analysis, definitely select the correct water treatment system (arsenic filter or arsenic remediation system) for your individual water quality situation. Not all arsenic reduction/removal filters work the same and not all will work in every situation! The Arsenic Quick Test II Mini-Kit detects low levels of arsenic, as low as 2 ppb (micrograms/L), in just 14 minutes. Testing can take place as easily in the field as it can in a lab, in a home, or just about anywhere. To make testing for arsenic in private wells more affordable, Arsenic Quick Test II Mini-Kits contain enough of the three needed reagents — tartaric acid (food grade), zinc powder, and monopersulfate — and patented detection strips to run two full tests for arsenic in water. While other arsenic test kits use harsher acids and have more complex testing procedures, Arsenic Quick Test Kits provide a safer, faster method for testing arsenic in well water, groundwater, surface water, etc. Arsenic Quick Test Kits work so well, in fact, that the States of Michigan and Arizona have each incorporated an Arsenic Quick Test Kit into their Arsenic Testing Compliance Regulations.